Figure 7-3. Mannitol formation in Leuconostoc. 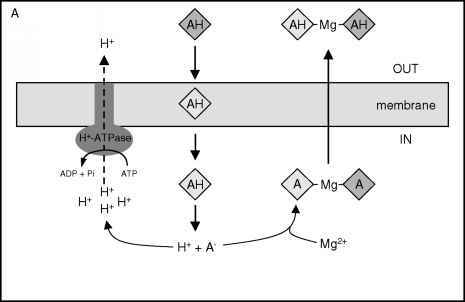 Phosphorylated glucose and fructose are metabolized by the heterofermentative (i.e., phosphoketolase) pathway. The reactions leading to lactic acid (from glyceralde-hyde-3-P) are not shown. Only the relevant enzymes are indicated; enzymes for all other reactions are given in Chapter 2. P=Phosphate. Adapted from Salou et al., 1994 Appl. Environ. Microbiol. 60:1459-1466.
depleted suggests that some might be formed indirectly from glucose (following its conversion to fructose via glucose isomerase).